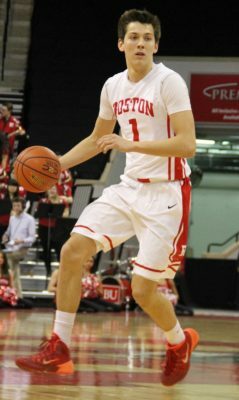 The Boston University men’s basketball team went into the night looking to rebound from a tough loss at the hands of Northeastern University. However, it was more of the same for the Terriers (0-2), who fell to the University at Albany by a score of 88-74. The Terriers were undoubtedly up against a tough opponent in the Great Danes (2-0), a perennial contender in the America East Conference that has found their way into the NCAA Tournament in three of the last five seasons. As the game opened up, the Terriers received a much-needed jolt of energy from senior forward Nick Havener. Sophomore Tyler Scanlon connected with a cutting Havener, who hammered home a thunderous jam to put his team on the board. Havener would continue to play well on the offensive end throughout the half, finishing with 15 points and shooting a perfect 6-6 from the field. Havener found himself limited by foul trouble in the second half. Whenever it seemed the Terriers were beginning to mount a run, the Danes were able to answer consistently on the other end. With the game deadlocked at 36-36, Havener nailed a pair of free throws to give the Terriers a two-point advantage. Albany forward Travis Charles laid it in on the other end to tie the game once again with 36 seconds remaining in the half. As the final seconds wound off the clock in the first half, freshman guard Javante McCoy slashed his way into the lane, and dished it back to Scanlon, whose potential go-ahead three-point jumper rattled out. Freshman forward Walter Whyte flew in from the perimeter to tip in the rebound and put the Terriers on top 40-38 heading into the locker room. In the early moments of the second half, the Danes began to pull away. With 9:52 left on the clock, Albany forward senior Greig Stire converted on a mid-range jumper to stretch the Danes’ advantage to 11. Even as the game seemed as if it were beginning to slip away from the Terriers, senior guard Cedric Hankerson attempted to lead a late comeback. After a jumbled possession, Havener cleaned up a loose ball and found Hankerson at the top of the key. Hankerson calmly buried the jumper, bringing the Terriers to within just six with 9:05 remaining in the half. However, despite Hankerson’s efforts, the Danes were able to get back on track shortly thereafter. With 7:32 remaining in the contest, Albany junior guard Joe Cremo was fouled and converted on both of his attempts as the Albany lead increased to 12. The Danes would not relinquish the lead, and sent the home crowd home without a win. Moving forward, Jones said he believes the tough competition his team is facing early on in the year will benefit the Terriers in the long run.